If you find yourself buying more games than ever before, there’s a very simple reason for this. With budgets as expensive as they are, games nowadays are designed to appeal to the largest possible audience. 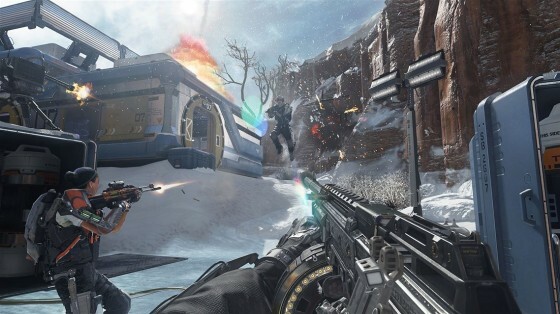 An easy way to achieve widespread appeal, especially when it comes to first-person shooters, is to add sci-fi elements. Indeed, this is the approach Respawn took with Titanfall by mixing military and mechs. 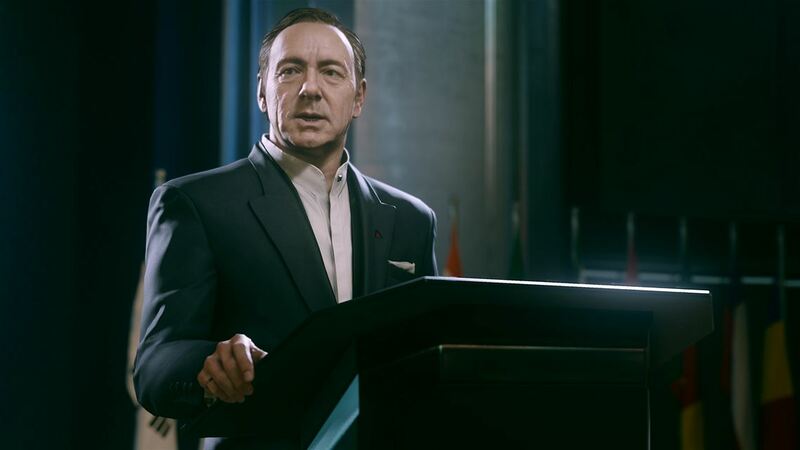 Sledgehammer’s Advanced Warfare follows in its footsteps, with a side order of Kevin Spacey for good measure. Spacey fills the role of Jonathan Irons, the head of private military corporation Atlas. Refusing to work with governments is one of the key elements to Atlas’ success – with bureaucracy pushed aside they’re able to get things done quickly and efficiently, even helping to turn Baghdad into the technologically advanced New Baghdad. Another reason for Atlas raking in countless contracts is that their soldiers come packing some impressive kit, including armour-coated Exo suits and grenades that automatically home-in on their hapless targets. After a brief – and predictably explosion filled – opening, a section set inside the Atlas research facility gives the chance to observe firsthand what the Exo-suits are capable of. Skill sets vary depending on mission – a cloaking ability unlocks for stealthy sections, for instance – and all of these skills can be upgraded by meeting the criteria of four ongoing combat-based challenges. The Exo-suits are by far the biggest ‘game changer’ here, making it easier to escape danger while dishing out some serious firepower. As per previous Call of Duty games, enemies throw grenades if you cower behind cover for too long but now grenade blasts can be evaded by dashing out of harm’s way. The double-jump meanwhile not only allows access to higher plains but can be bolstered with a ground smash that knocks enemies for six. As well as EMP grenades, sonic pulse emissions and more, some missions give access to a portable shield offering temporary protection. This becomes a lifesaver when playing on the harder difficulty levels; on the standard difficulty its purpose is negligible. Still, it does look flashy. Regrettably, style over substance is something of a recurring theme. A lot of Atlas’ tech can only be used in certain instances, and this can at times make the experience feel like a passive one. Imagine owning a high-tech Swiss Army Knife but permission has to be granted every time you wish to use it. That’s how we imagine Atlas’ highly skilled soldiers feel. Magnetic gloves allow buildings to be scaled but can only be used when prompted, while a rather nifty tool that bestows X-Ray vision has its use restricted to a single non-interactive set-piece. 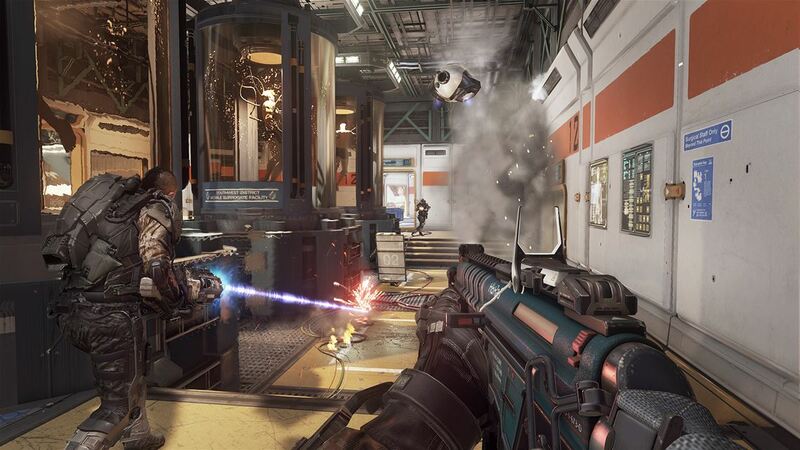 This is where Call of Duty would benefit from taking inspiration from the likes of Far Cry 3, Deus Ex and Dishonored. These games give you the tools and let you use them as you please. Here it’s always when instructed. Even stock arsenal such as mines have to be planted in highlighted areas. As such, the majority of Advance Warfare’s highlights are little more than flashy set-pieces which you have no control over. It speaks volumes that the most memorable mission is one that does give you free reign of one of the Exo’s unique gadgets. Specifically, a grappling hook with a rather nasty looking spiked tip. Combined with the newfound ability to whistle, it’s possible to lure enemies into dark areas and then harpoon them in a manner that would make Mortal Kombat’s Scorpion jealous. Non-linear in design, we wished there were more levels that were formed entirely of unscripted moments. Maybe one day Call of Duty will let us forge our own war stories instead of having to walk down a heavily scripted path. Sadly that day isn’t today. Perhaps we should be thankful that the handful of vehicular sections give the player complete control, rather than taking the on-rails approach, including a frantic futuristic bike chase through flooded city streets. Likewise, the plot stops attention levels from waning. Spacey delivers his lines well, utterly convinced that Atlas’ methods are for the greater good. The harsh reality however isn’t quite the case. The extra grunt of the current-generation consoles allows for far greater facial animation than before, resulting in the lead characters conveying far deeper emotions. This is the first Call of Duty where we’ve actually cared about the protagonist. He has a backstory, a cause for joining Atlas and something to fight for. Moreover, this is the first Call of Duty in a long time worth playing through for the story alone. Outside of the campaign, the Exo-suit helps to put a much needed spin on multiplayer mode. That’s in addition to some noteworthy nips and tucks including a swift matchmaking service, a training program for newcomers and a couple of new match types. Whereas death often came at the hands of seemingly random grenade throwing and an overuse of claymore mines in the past, the focus is back on proficient shooting while using the Exo-suit to escape heavy fire and reach higher areas. Believe it or not, in the five hours or so we spent playing team deathmatch we only had one grenade thrown at us. Even then we had the chance to throw it back to where it came from. All’s fair in love and war(fare). Another commendable improvement is that the map design (which favours boxy indoor locations, interconnected with corridors and small outdoor areas) does a fine job at preventing snipers from topping the leaderboards. To use our personal experience again, we fell foul of sniper fire just once during our play time. A new loot system – which takes the form of bonus supply crates – tops off the multiplayer mode nicely. These boxes of mystery goods are gained by rising up the ranks. Bagging a far superior weapon is really rewarding, while bonus XP tokens lasting 20 minutes or so give incentive to play a little longer. It’s a little hard to get excited about alternative gloves and knee pads to kit your character out with but nevertheless this new loot system is a very welcome addition. If only we could say the same about the four-player co-op Exo Survival mode. Here AI enemies attack in waves as you attempt to defend locations, defuse EMP bombs and gather dog tags depending on the current objective. Although the enemy AI is slightly smarter than that seen in similar co-op modes the difficulty level isn’t particularly challenging. After wave 25 the ensuing waves are then lazily repeated (or ‘flipped’, to use the correct terminology) except with enemies a tad tougher. We soon felt we’d seen everything Exo Survival had to offer. Suffice to say, a decent alternative to Zombies this isn’t. Overall though a far longer development period has worked wonders here – Advanced Warfare shows up last year’s Ghosts for the stop-gap product that it was. 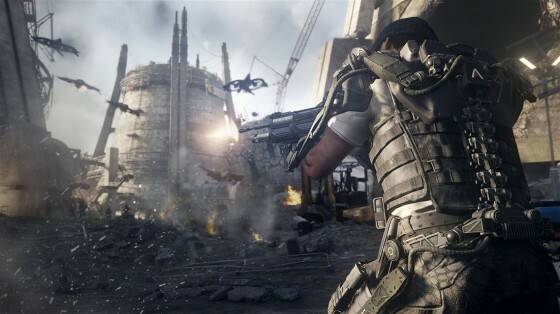 The campaign, although short-lived and lacking replay value, entertains in the way that only Call of Duty can while the multiplayer mode has come leaps and bounds. Pun fully intended, there. We’ve often seen the Call of Duty series as a guilty pleasure. This year it was simply a pleasure.